At Mini Oaks Adult Family Home, we know how choosing a home for your loved one(s) in challenging times, can be one of the most difficult decisions. If you are looking for a home-like environment in Lacey, suburb of Olympia, Washington in a quiet and peaceful neighbourhood with dedicated caregivers, please call Julia at: (360) 455-9038 for a tour! Mini Oaks Adult Family Home provides personalized, Dementia and Alzheimer's long-term care tailored by the unique needs of the client(s). We are a private home licensed by the Department of Health and Social Services (DSHS) with specializations in Dementia and mental health and 16 years of experience caring for seniors and adults in our home. Mini Oaks Adult Family Home has a placement capacity for up to 4 residents in need of assisted living and long term care for those who desire a home care setting instead of a large nursing home facility, large assisted living facility or retirement home. To provide the highest level of professional and compassionate care while enhancing the resident's quality of life physically, mentally, emotionally and socially. To be an alternative to nursing homes where the resident feels home. To respect that each resident is unique, hence, to tailor services to each individual's needs including dietary requirements and menu preferences. Our goal is to continue maintaining the health, independence, dignity, and quality of life of the resident in their retirement years. "Caring for the elders is one of the most important part of our culture. We started by caring for our own aging parents, thus, we have experienced first- hand with the unique difficulties which come from caring for a loved one in your own home. We feel a sense of tremendous satisfaction when we care for our residents and we believe that one cannot care with quality, unless they care by in a family setting." Services offered to senior citizens and adults who require long-term care or assisted living in Washington state, especially in Lacey, or Olympia. Take a tour and experience our pleasant, comfortable and safe home, please contact us, anytime! Our home is located in a quiet residential neighborhood in Lacey, suburb of Olympia, Washington. Julia cooks daily home-made meals, cakes and pastries, customized to the resident's dietary needs. Residents celebrate different events and milestones in our home. Julia takes pride in her excellent party planning skills. Pet therapy provided by our toy poodle, Becky. Becky greets the residents every morning. She is a great companion, always ready to offer her love. Rooms are bright and cozy and can be designed with the resident's furniture and memorabilia. Daily activities can be provided for residents who desire entertainment and leisure activities. 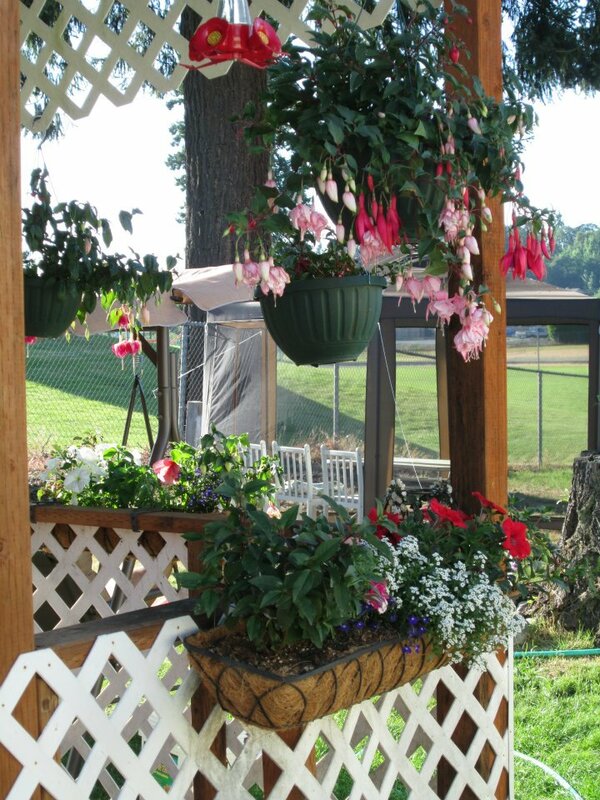 The residents enjoy Julia's beautiful Fuchsia baskets and hummingbirds in the gazebo or the roses, trees and a variety of birds on the one and a half acre of land. Residents can take a walk in a wheelchair accessible and fenced, flower garden and yard. Family and friends can visit, anytime!